Linksys is teaming up with Trend Micro to put the Home Network Defender internet security software into the their routers, helping to block out unsafe sites before they reach any computer on your network. Home Network Defender previously existed as an application for PCs that more or less did the same thing. But now that it's installed on the router, any PC connected to the network will be protected. It's not so much software to detect and clean viruses, since that would cause a certain amount of router lag, but instead a way to filter out dangerous sites before they reach your computer (they have, however, hinted at more advanced network monitoring coming in the future). The software will basically deny access to any site it deems unsafe based on a set of predetermined criteria and constantly talks to Trend Micro's server to determine how secure a site is. But you can adjust the sensitivity level of the filter and/or filter out specific sites as you see fit. And if there's a site deemed unsafe you think shouldn't be, you can notify Linksys for consideration. Home Network Defender will first be available preloaded on new Linksys WRT310N and WRT610N routers, and also available as an upgrade for those who already own these same models. Pricing runs at $60/year (with a special $10 discount for the first 60 days) for the service and includes 4 free copies of Trend Micro's AntiVirus software, which will keep Windows machines disease-free. 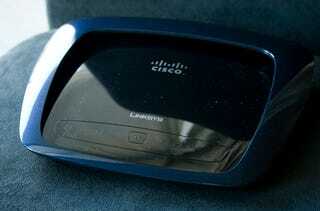 February 17, 2009 — Cisco® and Trend Micro have teamed up to help keep families safe by integrating Trend Micro's Internet security software into Linksys by Cisco wireless routers. This multi-layered security offering helps provide network protection for family PCs and other home-network devices, such as online game consoles, Wi-Fi enabled phones, and personal media players. This collaboration has led to the introduction of Home Network Defender, an Internet security service that features Safe Web Surfing capabilities, parental controls, and user-activity reporting embedded on select Linksys by Cisco wireless-N home routers. Home Network Defender helps to detect and eradicate Web threats such as online fraud, scams, phishing schemes, predators and viruses before they enter the home network. *Safe Web Surfing – Helps protect against Web threats by evaluating security risk in real-time and blocks sites and links identified as malicious. By choosing one of three security level settings, Home Network Defender helps users reduce online phishing scams that try to steal credit card or bank account numbers. Continuous updates identify the latest risky Web sites—and even legitimate ones that contain threats. This is especially effective for game consoles with Internet browsers that on their own may have weak Internet security. *Parental Controls –Help family members view appropriate Web site content based on the customized rules set by the parent, and can even restrict access at specific times. Unlike other products with some of these features, Home Network Defender acts at the router level, outsmarting even the most tech-savvy kids from altering controls on their PCs while helping to protect Internet users from inadvertently visiting compromising sites or revealing personal information to predators who operate over the Web. * Network Activity Reports – Allow parents or network administrators to monitor network devices and activities, prompting instant detection and prevention of intruding devices on the home or small-business network, as well as reports of parental control violations by users. Administrators can view their network reports from anywhere in the world with their unique password. *Antivirus- Includes four licenses of Trend Micro™ AntiVirus plus AntiSpyware to complement the Internet security protection on the routers, providing a true multi-layer protection solution. *Less complex to use-With Internet security software housed directly on the router, there is no need to install it separately on each PC. Linksys Easy Link Advisor (LELA) application assists in setup of parental controls on a device by simply clicking on graphical icon of the device and providing the desired settings. "Our leading Internet security software paired with top-of-the-line Linksys by Cisco routers delivers a powerful solution for home network security," said Carol Carpenter, vice president of global marketing for Trend Micro's consumer business unit. "We are pleased to be able to offer smart and effective Internet protection for the home so that families can receive the strongest real-time protection against the latest Internet threats while enjoying online activities to the fullest." "Home Network Defender helps provide revolutionary, not evolutionary, protection from Internet threats before they reach the home while increasing awareness for parents of the activities specific to each family member. This product helps protect not only PCs but any connected device and is a must for anyone concerned with Internet safety for their family," said Greg Memo, Vice President and General Manager, Products, Cisco Consumer Business Group. Home Network Defender will be available for select N routers and is embedded in new WRT310N and WRT610N Linksys by Cisco routers, with a 30-day complimentary trial. This price and the router model availability are specific to North America.